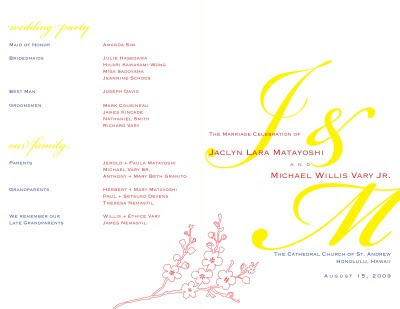 As a side project, I'm designing the wedding programs for one of my friends at MIT. I was just poking around theknot.com, looking at some examples for bursts of inspiration, but after a few minutes just about every other page was encouraging me to register for a free account on the website. Oh, funny... Although I can't help but think to myself, "Hm...I like that, don't like that, like that..." when I observe or see various things at different weddings, it's probably best to lay most of that thinking aside. The proper time will come when it's my turn - but until then, I'm content to play a small part in my friends' happiness, even if it's in a graphic sort of way. 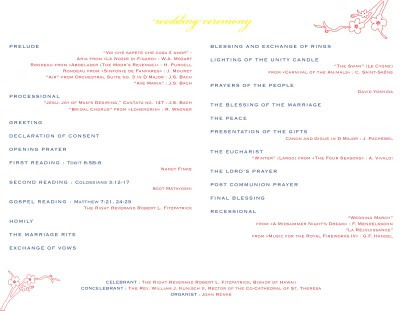 these are such gorgeous wedding programs!!! very nice wedding stuff! did u draw/make those flowers yourself?